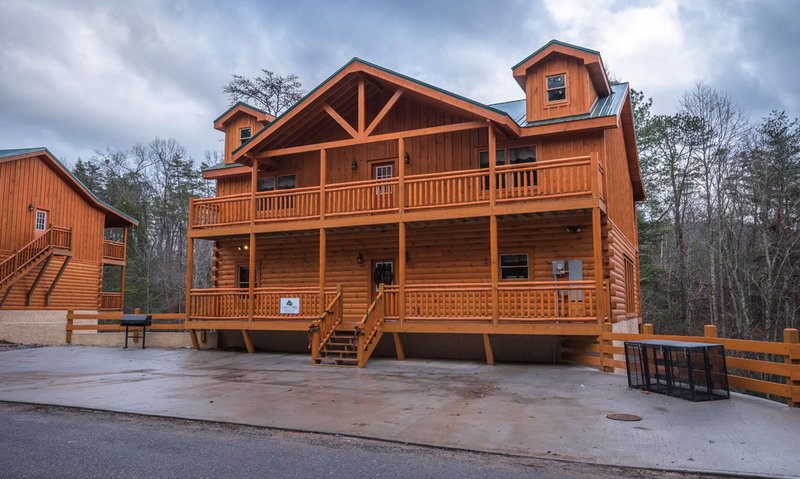 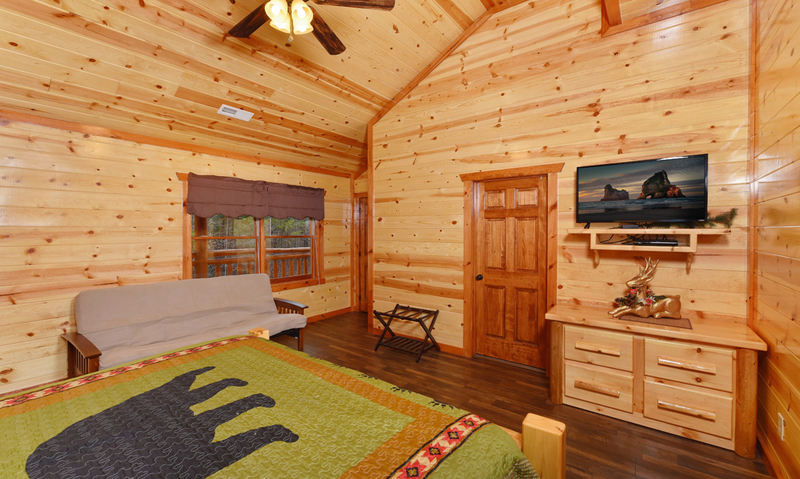 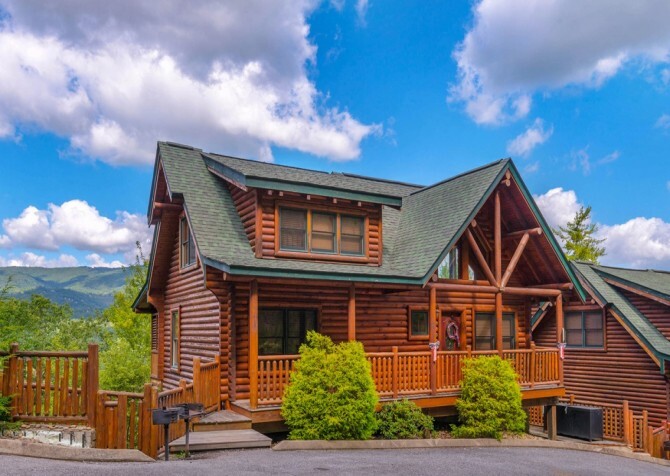 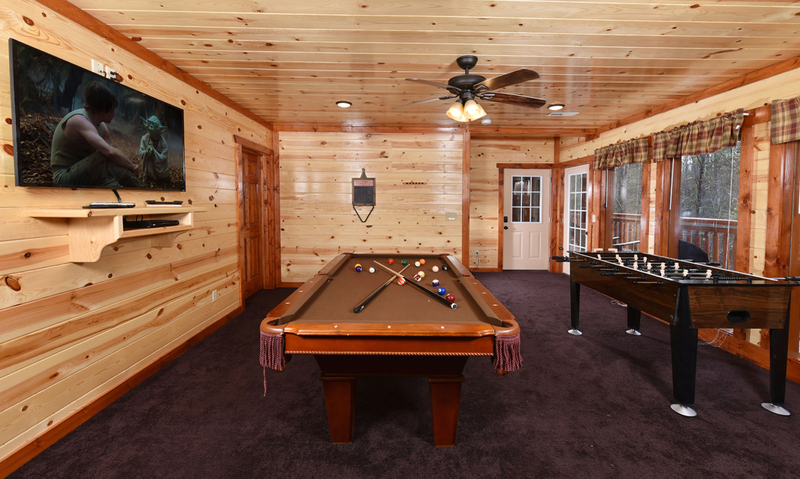 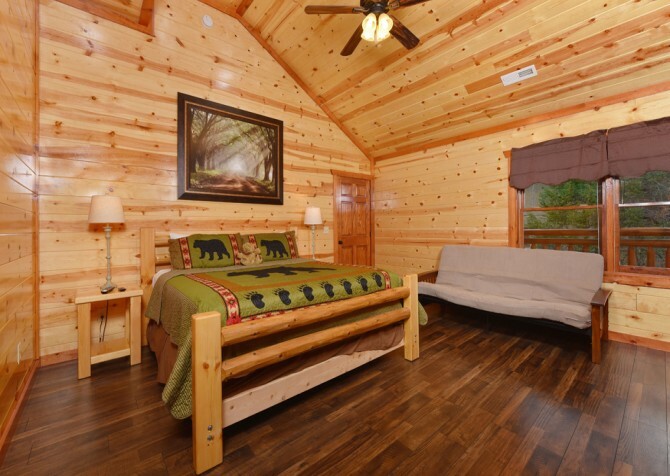 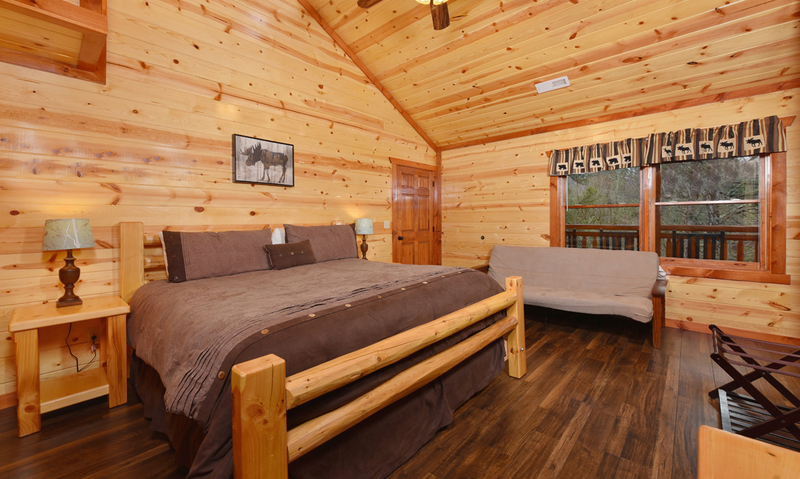 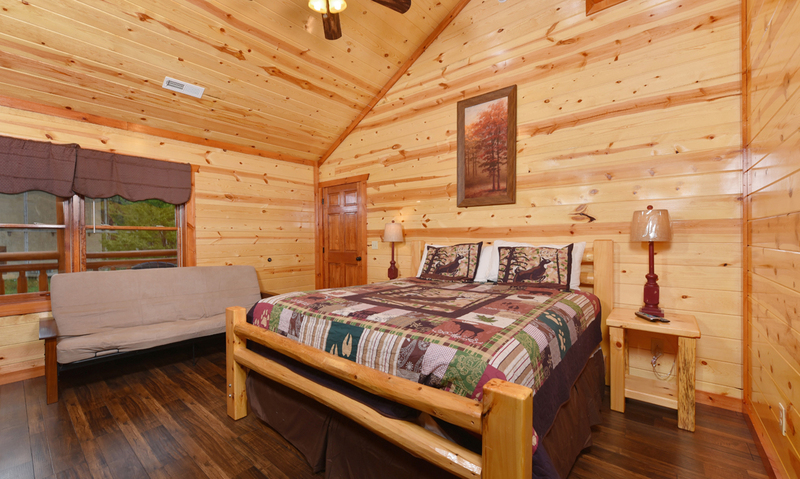 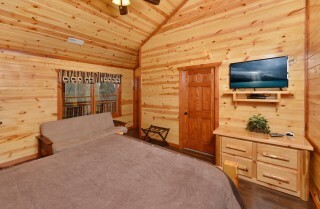 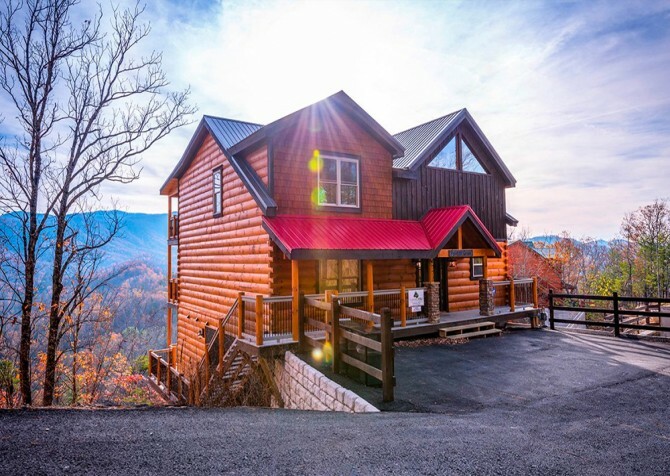 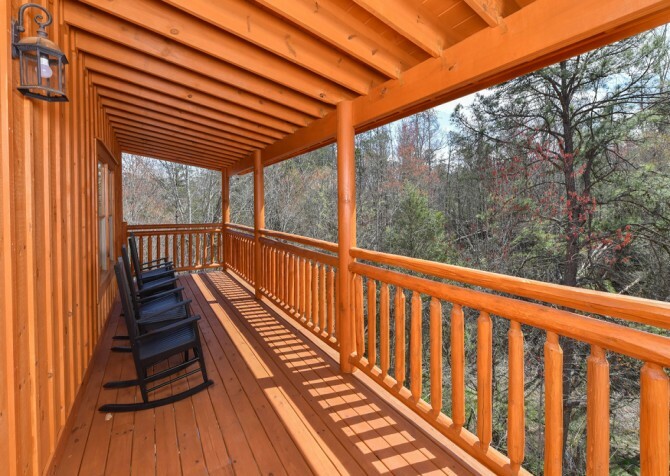 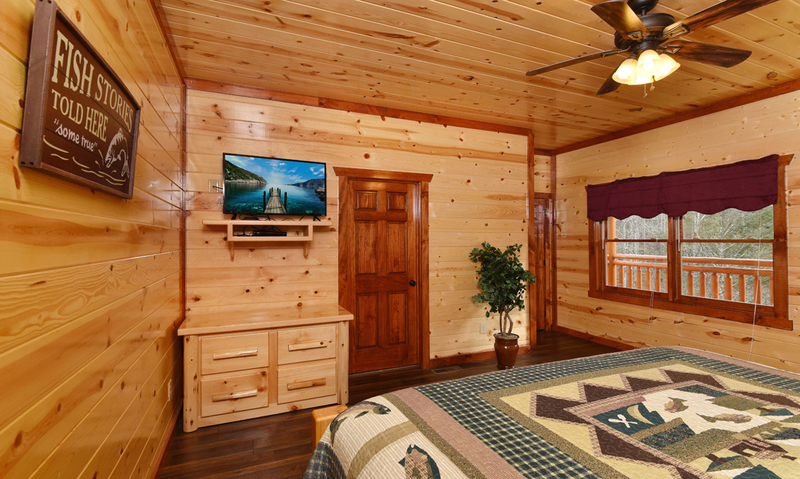 Perfect for large family trips, girlfriend getaways, and couples’ retreats, Emerald and Evergreen at Sherwood is a 6-bedroom, 6 ½-bathroom cabin in Pigeon Forge with wooded views and entertaining spaces. 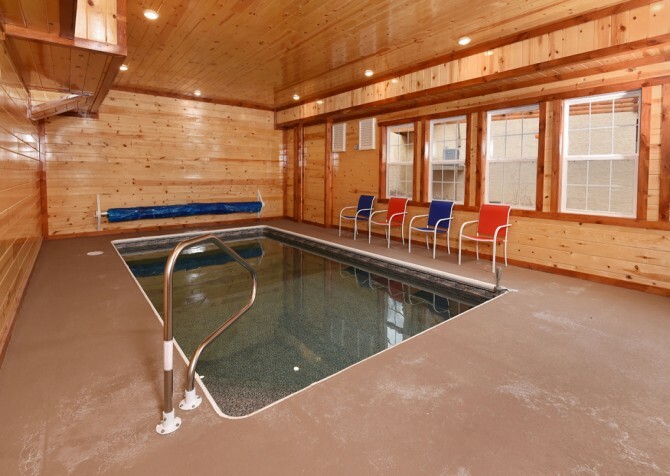 Spend mornings with a cup of joe on one of the 4 spacious decks, afternoons with a splash in the private indoor pool, evenings with a game tournament in the rec room, nights with an action flick in the home theater — and that’s just the start! 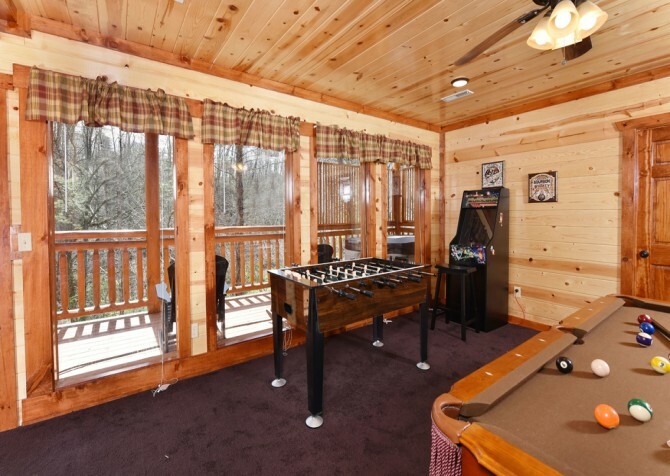 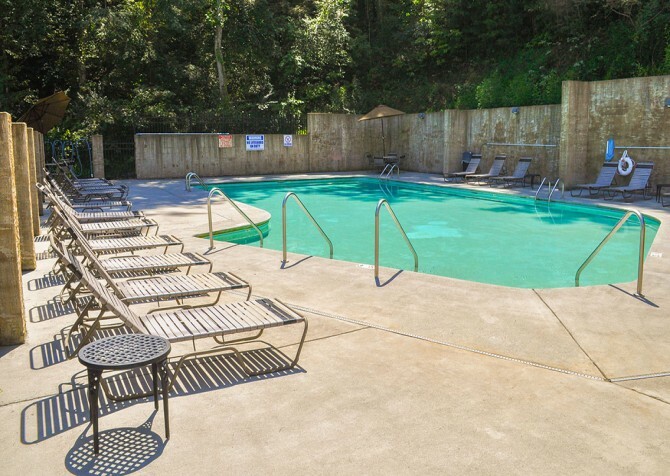 There’s something for everyone to enjoy at this spacious home away from home in the Smoky Mountains. 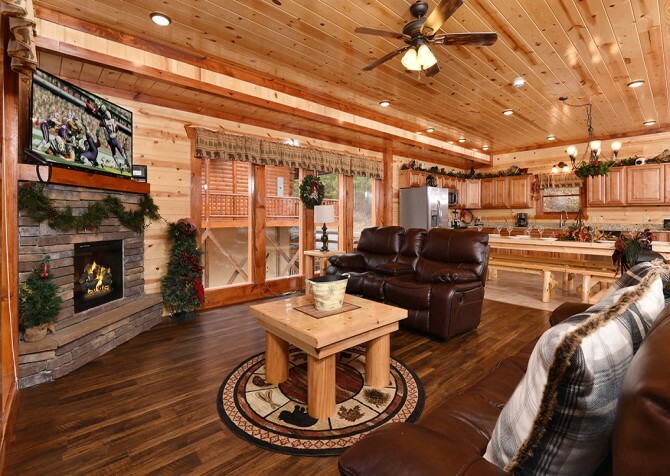 Leave your bags behind and head straight to the living room for a rest on the reclining sofas, one complete with built-in drink holders — convenience at its best! Flip on the big screen TV and catch up on your favorite TV drama with your gal pals. 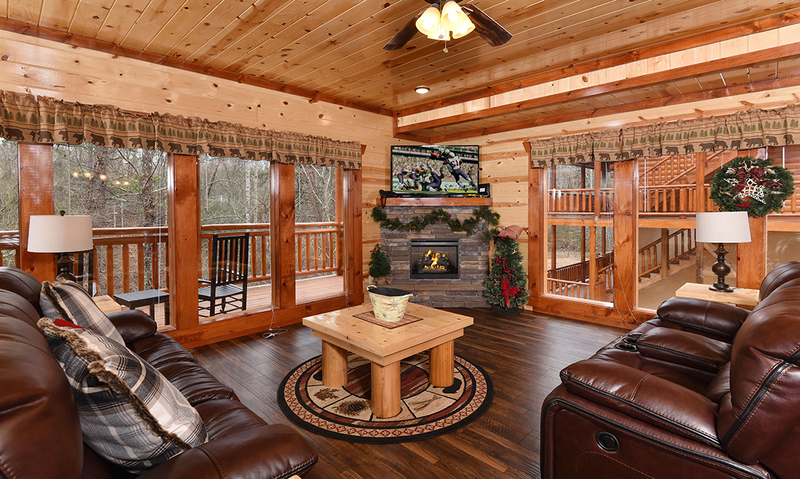 After sunset, turn on the electric fireplace to really set the vacation mood; add a book into the mix and turn cliché into reality. If a party’s more your style, toss a pizza on the coffee table, place some drinks on the end tables, play a few guitar tunes, and groove to the beat. After all, an awesome trip like this deserves a celebration! 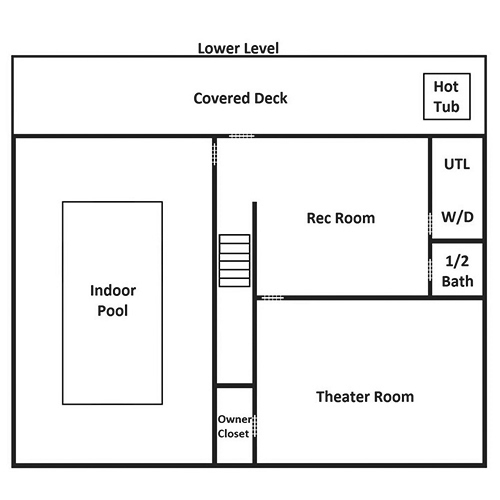 Only steps away from the living space is the large, open kitchen — great for extending the dance floor or whipping up a few party treats. Fully equipped with stainless-steel appliances and spacious countertops, preparing meals will be easy as pie…which you could make! Grab ingredients from the fridge, wash them in the double sink, chop up a few in the blender, and heat them on the stove. 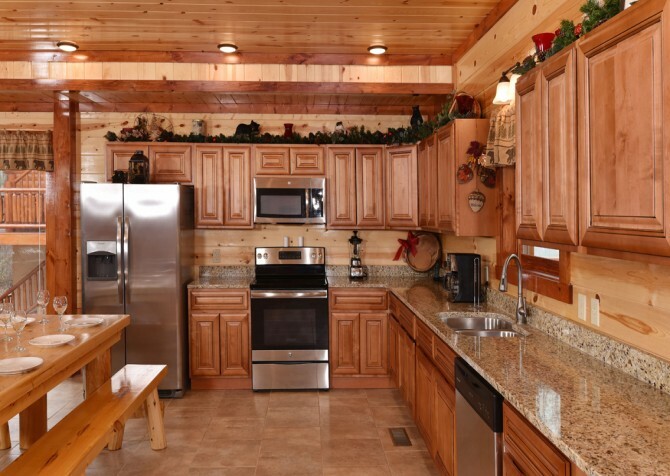 Keep biscuits warm in the oven, gravy hot in the microwave, desserts in the freezer, and a fresh brew ready to go in the coffeemaker. 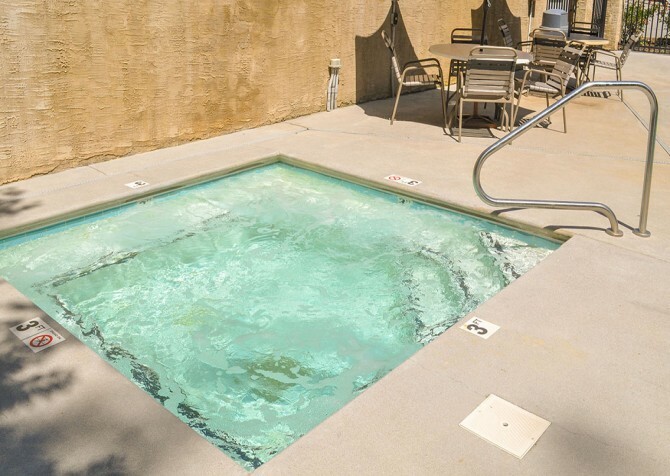 Plus, there’s a handy dishwasher to help with the aftermath — volunteering a few friends to help out is perfectly fine as well. Within the kitchen, a large, wooden dining table featuring 4 matching benches awaits your every meal. 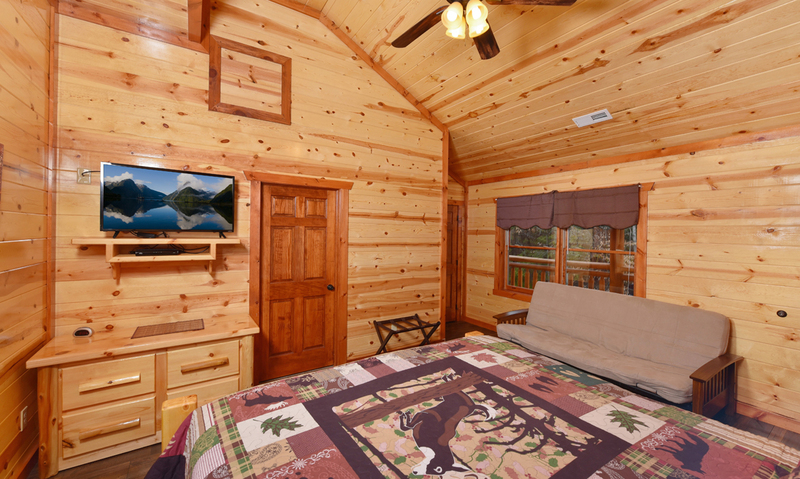 Scarf down cereal for breakfast, restaurant leftovers for lunch, a hearty dish for dinner, and baked goodies for a midnight snack. 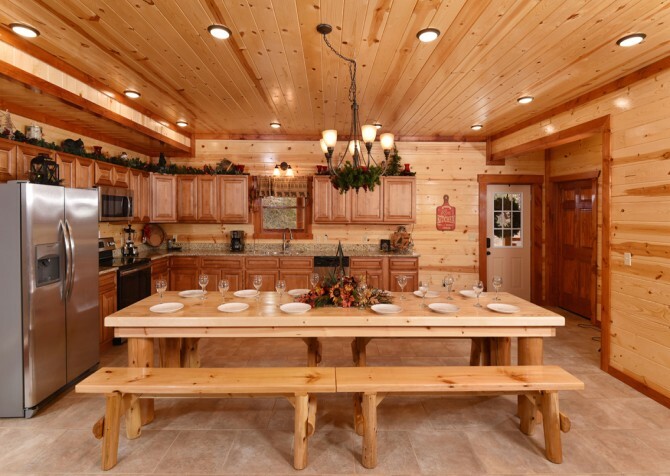 Not just for mealtimes, take advantage of the natural light throughout the day in the dining area for coloring time with the kids, arts and crafts with your friends, or jotting down ideas for your latest novel. 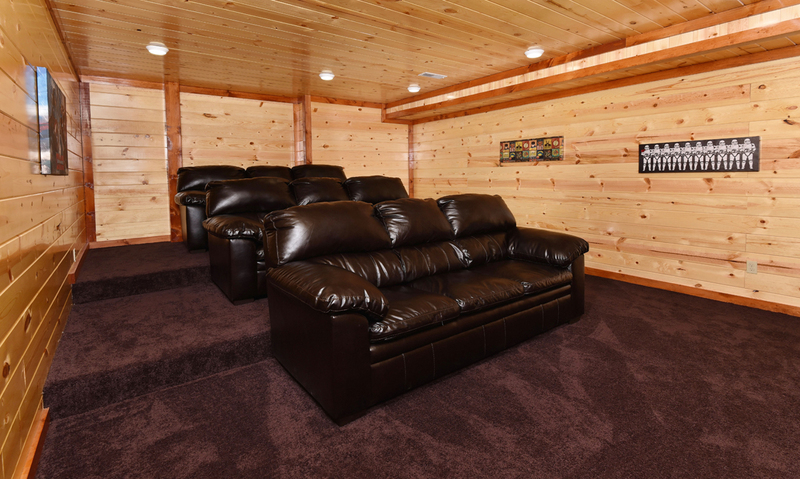 Second on the list is the home theater — enough said! However, it may interest you to know that this theater room comes equipped with not only a mounted big screen TV but also 3 comfy couches on 3 rows — theater style. 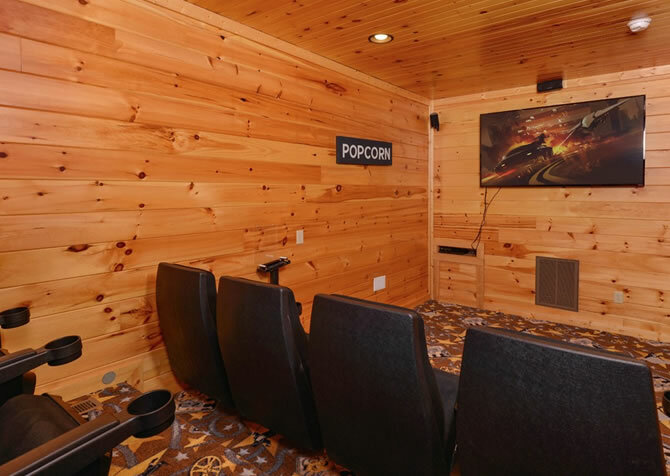 With a Blu-ray player at the ready, take inspiration from the storm troopers on the wall and go for a Star Wars classic or raise the laughter bar with a modern comedy. 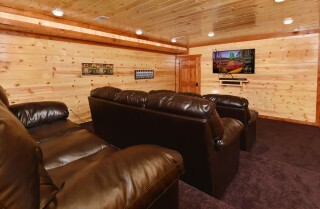 Last person seated pops the popcorn! Last, but certainly not least, is the private indoor pool with plenty of natural light from the 8 windows nearby. Seating is provided for those who would rather take in the wooded view or watch the kids splash around. Swim a few morning laps, doggie paddle with the little ones, or end the night with a quick dip — the options are endless! 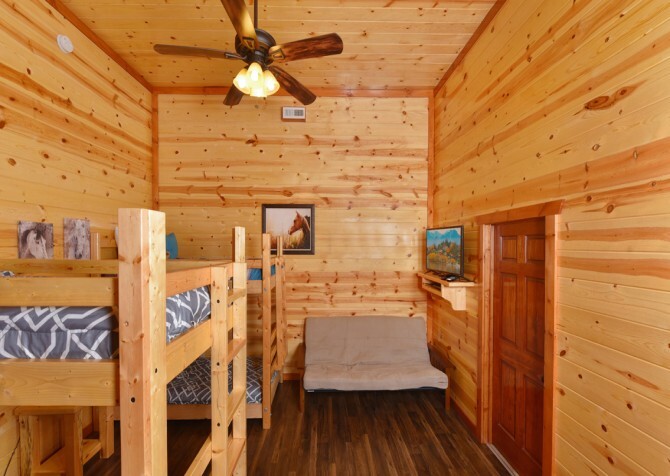 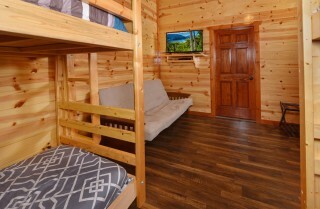 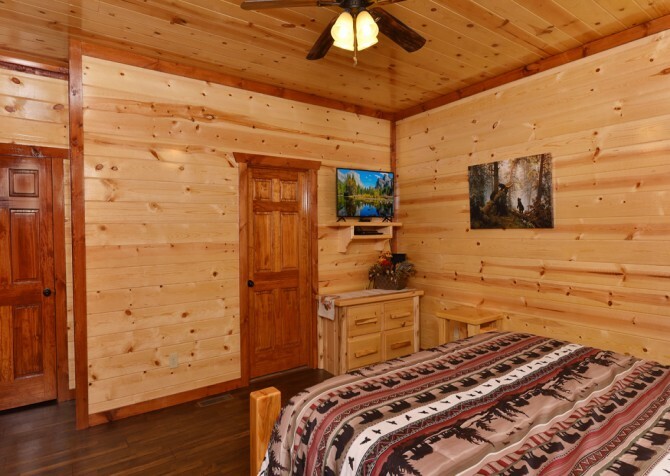 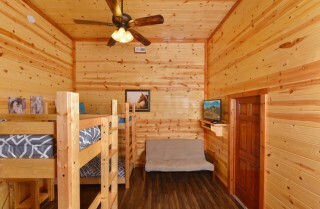 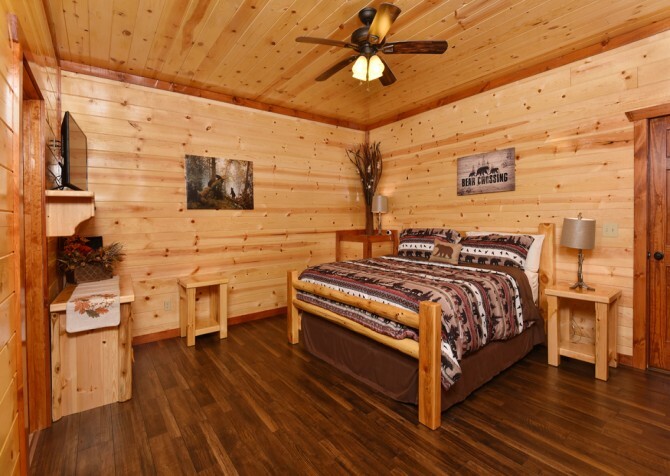 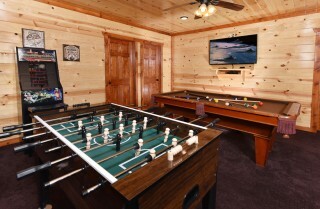 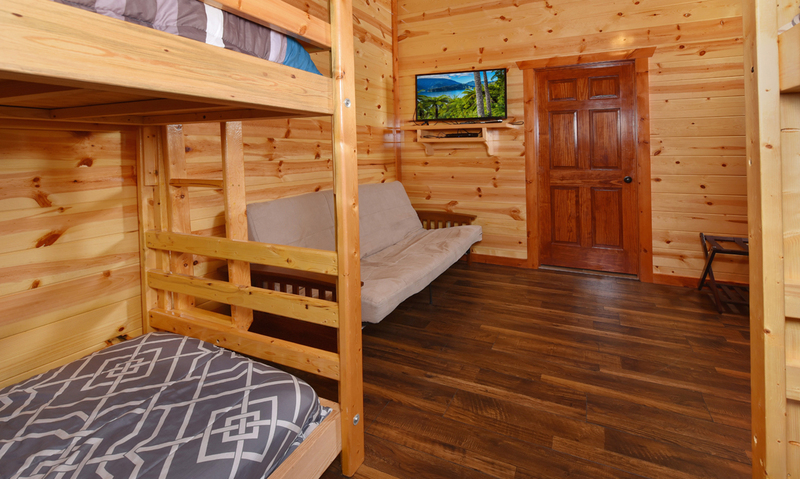 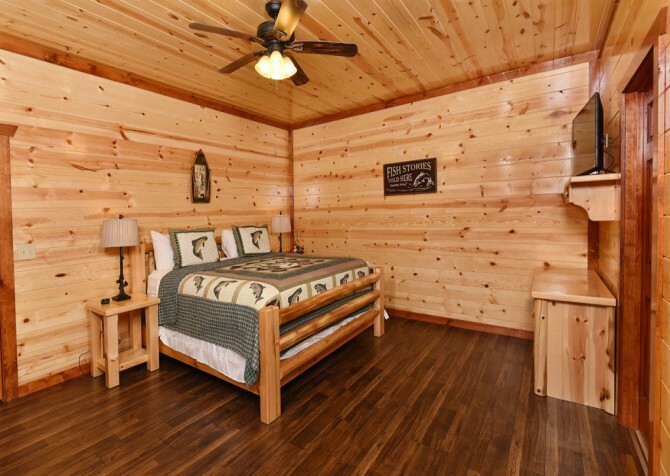 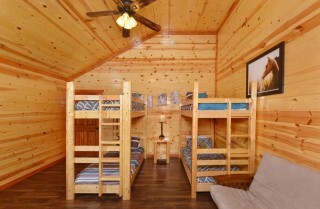 This cozy cabin is home to 5 king-size beds, 2 twin bunks, 4 futons (1 in each second-level bedroom) and 6 spacious bedrooms, each featuring a flatscreen TV! Curl up with your spouse in one of the 2 entry-level bedrooms for a romance movie before bed. 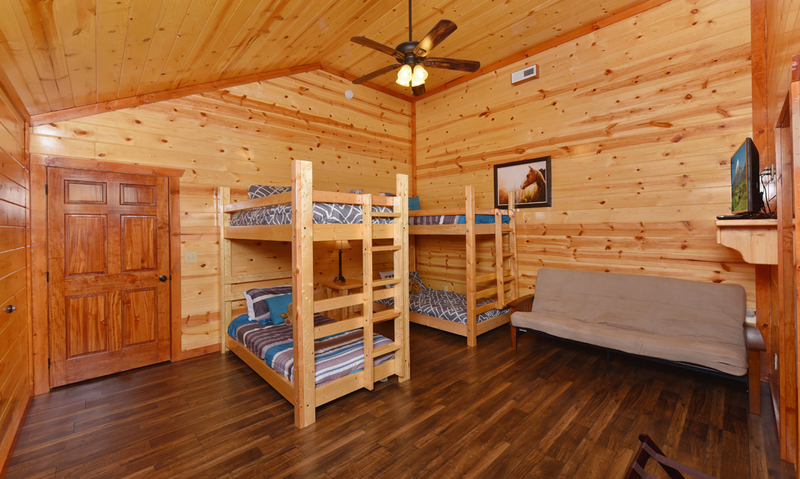 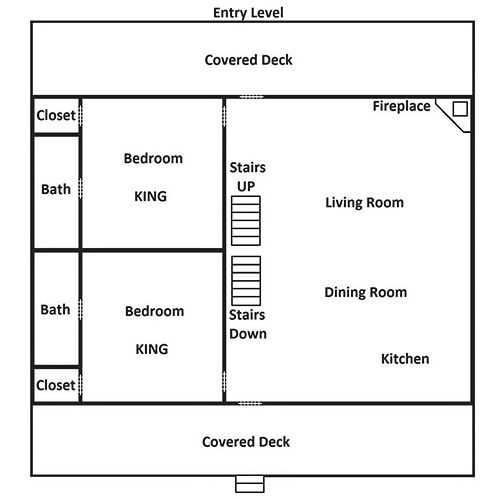 Read a bedtime story to the kids in the bunkbed room and bid your friends goodnight in the 3 other bedrooms on the second floor. 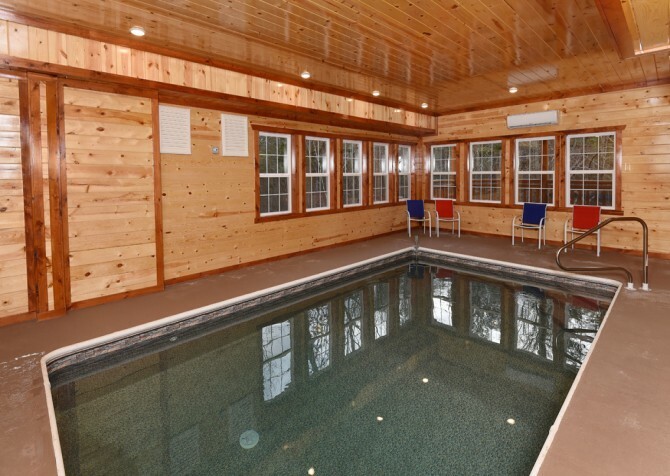 Not to worry, there are 6 ½ bathrooms in this home — 4 being full en-suite baths — so getting ready in the morning won’t be a hassle! Featuring a smooth drive to a flat, paved driveway with parking for 6 (including room for a trailer), this motorcycle-friendly abode was made for large groups. 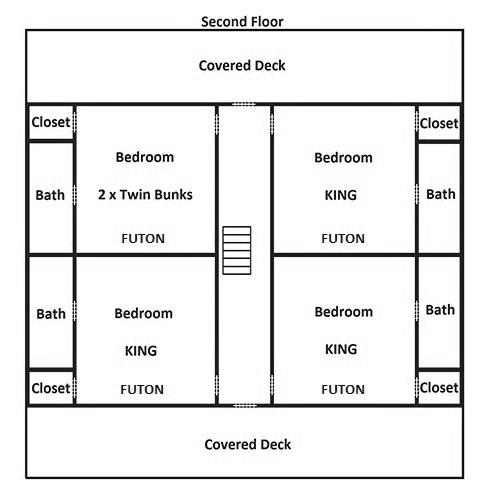 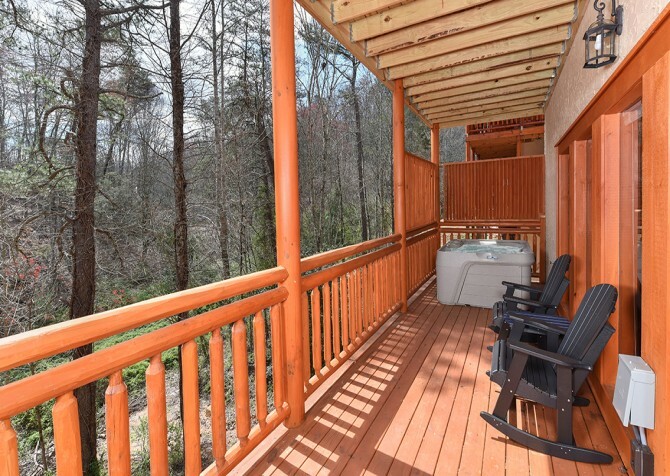 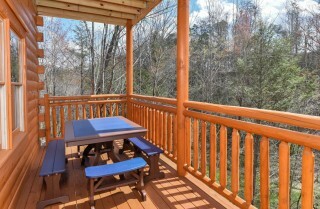 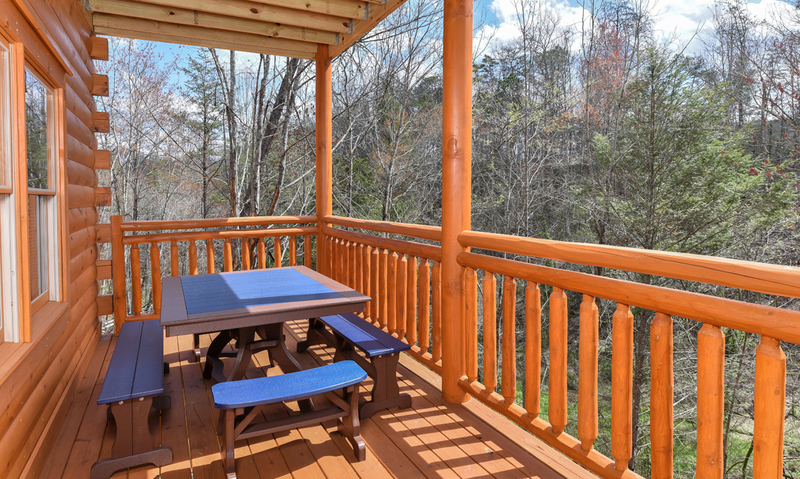 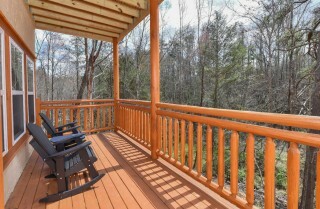 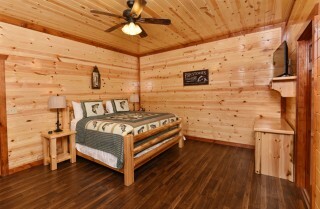 Enjoy 4 cabin decks — all spacious, 3 with wooded views, 2 with rocking chairs, and 1 with a hot tub! 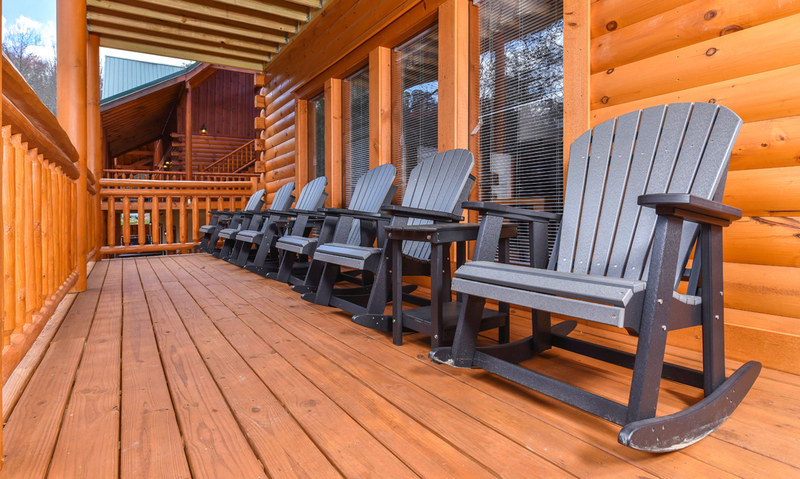 Plus, a picnic-style, charcoal grill is ready to barbecue when you are. Shish kabobs, sirloin steaks, grilled veggies…mealtime won’t come fast enough! Craving more amenities? You got it! 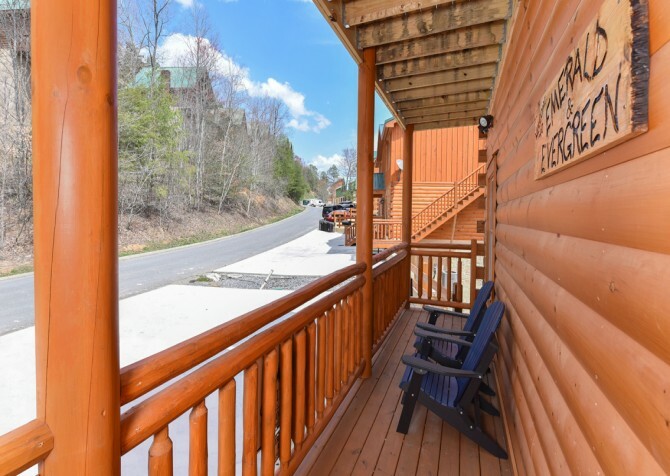 Leave room in the car to bring home a trunk full of Smoky Mountain souvenirs with the help of the provided washer and dryer on the lower level. 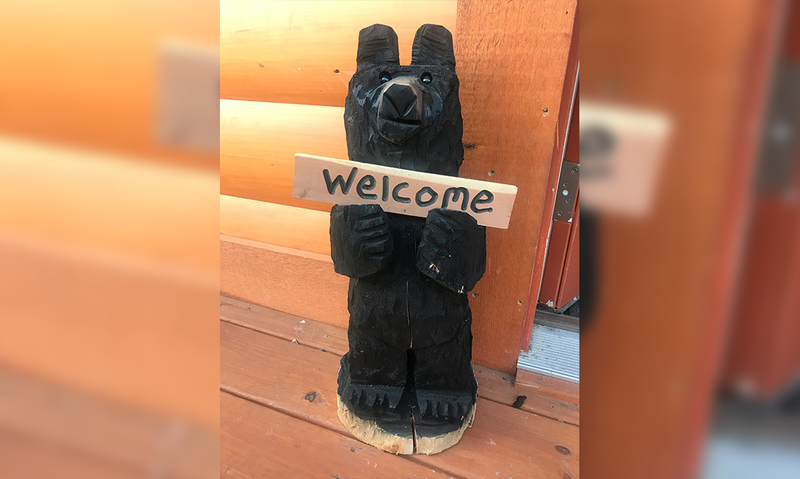 Upload videos to your YouTube channel lickety-split to document every memorable moment with the complimentary high-speed internet. Best of all, sunbathe at the outdoor pool in Sherwood Forest, a gated community that Emerald and Evergreen at Sherwood is proud to be a part of! 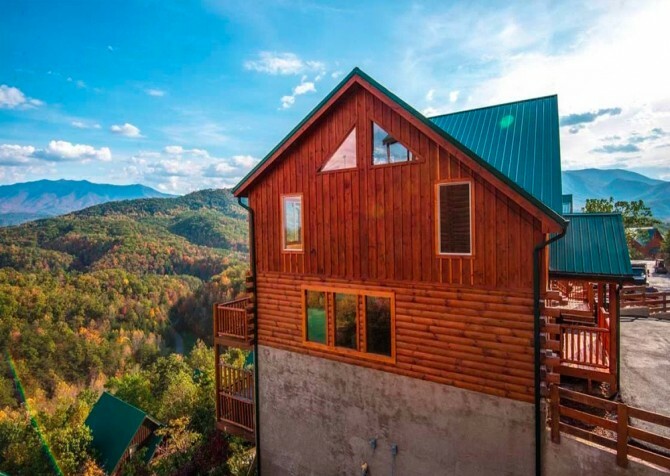 Take the good times to town in Pigeon Forge, a bustling city filled with entertainment and attractions galore! From outdoor excursions to indoor excitement, boredom is unheard of here. 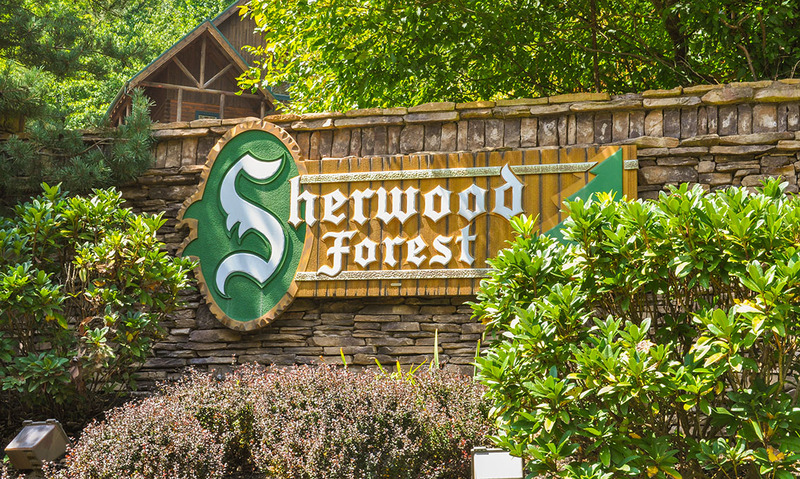 Fly up to 25mph through the forest canopy with family and friends at Smoky Mountain Ziplines! Bump your bestie, go-kart with your kids, putt-putt to victory, and beat the highest arcade score at The Track. Put your communication skills to the test with up to 8 of your closest friends as you try to crack the case, solve the mystery, and break free at Kryptology Escape Rooms.